Bonded Leather Two View Table Tent 4x6 is offered in choice of leather color and choice of interior panel color. Holds two 4" x 6" inserts in an A frame format. May be customized by adding a 2" header with your logo or artwork. Bonded Leather Two View Table Tent 4x7 is offered in choice of leather color and choice of interior panel color. Holds two 4" x 7" inserts in an A frame format. May be customized by adding a 2" header with your logo or artwork. Bonded Leather Two View Table Tent 5x7 is offered in choice of leather color and choice of interior panel color. Holds two 5" x 7" inserts in an A frame format. May be customized by adding a 2" header with your logo or artwork. Bonded Leather Two View Table Tent 5.5x8.5 is offered in choice of leather color and choice of interior panel color. 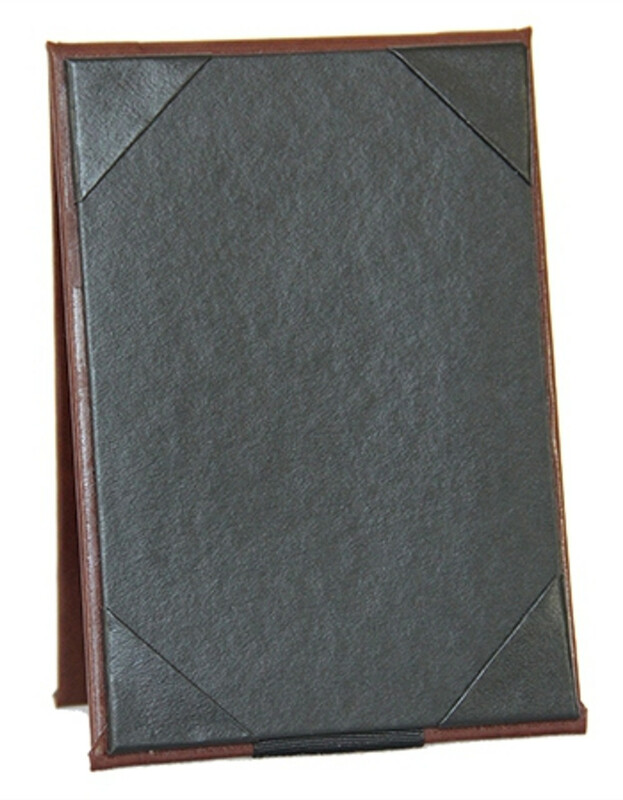 Holds two 5.5" x 8.5" inserts in an A frame format. May be customized by adding a 2" header with your logo or artwork.